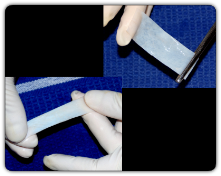 Biomed Design, LLC and its affiliate company, Biomedical Design, Inc., have developed patented methods, BDLink™ and BDSter™, both liquid, non-gluteraldehyde tissue preparation processes, used for the treatment of biological tissue prior to surgical implantation. All patents include international counterparts. Contact us for a comprehensive technology overview.